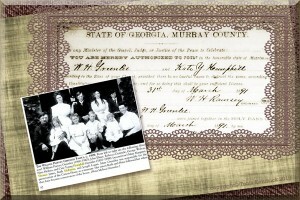 William Harvey Greenlee and Kate Young Hemphill were married on March 31, 1891 in Murray County, Georgia1. Kate was my great-grandfather’s (James A. Hemphill) sister. 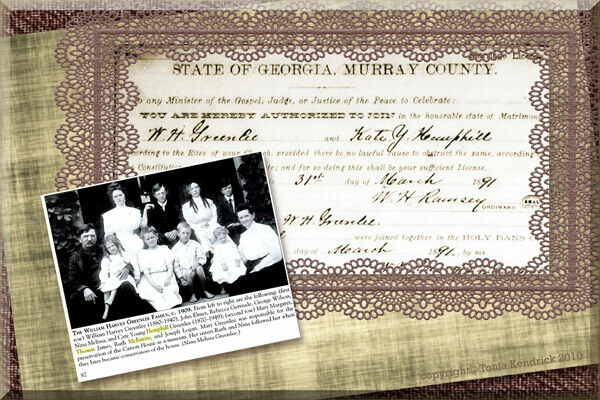 After her marriage, Kate moved to McDowell County, North Carolina, the ancestral home of both her parents. The photograph in the collage shows their family about 18 years after they married2. W. H. is seated on the far left and Kate is seated on the far right, with their children in the middle.